A recent article in the Whiteout Press appears to have reignited the debate about vaccines causing autism and has now been reported by Fox News in Austin Texas. But what both appear to overlook is the direct evidence from leading US health agencies and health officials which discredits all the prior evidence they have used and which is still being used on the internet and in the media to claim there is no autism-MMR vaccine link. [Full quotes and links below]. Fox News in Austin Texas reported yesterday on the Whiteout Press article: Article stirs autism and vaccine debate Aug 15, 2013 By Noelle Newton KTBC Fox 7 Austin Texas USA. And here is the Whiteout Press article: “Courts Quietly Confirm MMR Vaccine Causes Autism” 27th July 2013. Here is the problem for health officials now. The US Heath Resources Services Agency and vaccine maker Merck’s vaccine division Director Julie Gerberding when heading up the US Centers for Disease Control as its Director both separately confirmed on and to national broadcast US news channels back in 2008 that any vaccine can cause an autistic condition [full quotes and sources below]. That confirmation immediately made completely invalid and useless all the “tobacco-science” statistical studies health officials had used to claim there was no connection between a child developing autism from the MMR vaccine. Because researchers claimed to find no difference they assumed no link. But they found no link because all those studies were intentionally carried out on the basis that only the MMR vaccine was a cause of autism and not all vaccines. So now all those previous studies compared kids with autism who had MMR vaccine against kids with autism who had other vaccines and got autism from the other vaccines. If you go shopping and compare all the candy in one store with all the candy all other stores all you will find is that its all candy. Some might be Hersheys and some not. But it is still candy. Autistic conditions are like candy just in the sense there are all kinds and flavors but in a spectrum. Of course that is where the similarity ends because the spectrum of autistic conditions is from the most debilitating to the least. There is nothing sweet or attractive about that. 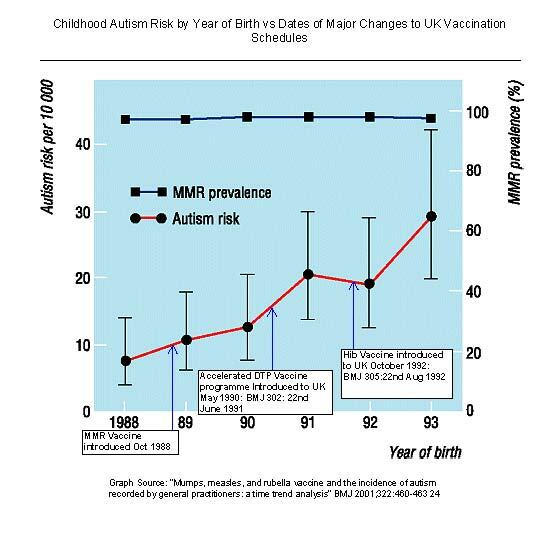 And if you want evidence of this then watch the British rate of childhood autism diagnoses increase with each change in the vaccine schedule. This is a chart from a peer reviewed paper by US authors and researchers which only looked at the MMR vaccine and not the other vaccines. The graph above is adapted from a 2001British Medical Journal paper by Jick et al: Mumps, measles, and rubella vaccine and the incidence of autism recorded by general practitioners: a time trend analysis” BMJ 2001; 322 : 460 – 463 24 February. The admissions by the US CDC Director Julie Gerberding and those by the US HRSA were not given voluntarily. They only confirmed the true position when put under pressure by the media in 2008 when the Hannah Poling story broke about the US Court compensating a little girl who became autistic after getting NINE vaccines ALL ON THE SAME DAY. But everyone overlooks that and the same old junk studies are being quoted all over the media and internet as evidence there is no link when they are completely useless as evidence for that proposition. And then some studies looked for higher autism rates in the MMR vaccinated-autism kids. That is like looking to see whether under the wrapper of one brand like Hershey’s there is chocolate candy and under the wrappers of other brands like M&M’s it is chocolate candy or something of a different flavor or sweeter or less sweet. The data show when correlated with major changes in the UK childhood vaccination programme the most likely “environmental factors not yet identified” are the vaccines. With each major change to the UK’s childhood vaccination programme cases of childhood autism increased substantially. As anyone can see from this, the studies needed to be done are comparing the total health of vaccinated kids with never vaccinated kids. But the US CDC will never do them because never vaccinated kids are much healthier so showing the vaccine programmes pursued by the US CDC for decades do more harm than good. The argument used to claim the studies cannot be done is junk – they claim it is unethical to prove a vaccine is safe to use or dangerous so we cannot do the studies. This is on the basis it is unethical not to vaccinate a few kids to make sure millions upon millions of kids will be safe. It cannot be unethical if done with consent and where the comparatively few kids who are not vaccinated can still be vaccinated after the studies are over. Surely, if “herd immunity” worked those few would still be protected by it? And of course it is unethical to give any drug of unproven safety to any child. So according to the HRSA vaccines cause encephalopathies [general brain injuries] which result in autism and/or seizures in children. You can even watch Gerberding saying it to Dr Sanjay Gupta of CNN here on YouTube. If you watch the video [below on this page] you will then realise Dr Julie Gerberding is personally knowingly responsible for the biggest longest running programme of child abuse in the history of the planet – knowingly causing autism in hundreds of thousands of US children using vaccines [currently around 1 in 50 US kids depending on State]- and when she was in a position to stop it dead. She then left the CDC and continued where she left off to join vaccine maker Merck as its vaccines division Director. The CDC was officially castigated by the US Senate in an official report “CDC Off Center” as an agency which “cannot demonstrate it is controlling disease“ but which was managing to spend US$11 billion in US tax dollars every year not doing what even its name says it is supposed to – Center for Disease Control. That is not correct. Here we set out four ways autistic conditions are caused and confirmed by statements from the current President of pharmaceutical giant Merck’s Vaccines Division, by US Government agencies, by the US Federal Court and in formally published academic journal papers. The first known cause of autism was rubella virus. So not only is New Scientist an unreliable source of information, this cause of autism has been known since the 1960s. And rubella virus is one of the three live viruses in the MMR vaccine. “FAQs (frequently asked questions) about MMR Vaccine & Autism” [ED 8/Apr/12: This is the web archive of the CDC page – you will need to search in or scroll down the page to see the text. As papers cited on the original page by the CDC as evidence for no link with the vaccine have been steadily discredited it seems the CDC has decided to remove the page and it seems someone has been deleting the archived versions of the page from the web archive too]. Chess, S. Autism in children with congenital rubella. J Autism Child Schizophr. 1, 33-47 (1971). Mitochondrial dysfunction is claimed to be “rare” but is not. It can apply to a minimum of 20% of cases. [Gerberding went from the US agency charged with promoting vaccines [CDC] directly to become vaccine maker Merck’s Director of Vaccines Division: Dr. Julie Gerberding Named President of Merck Vaccines – 21 Dec 2009 – Merck & Co., Inc. So there is direct evidence that live measles, mumps or rubella viruses separately can cause encephalitis leading to autism. 1. Effects of viruses on the immune system, immune-complex diseases, and antibody-mediated immunologic injury Bulletin of The World Health Organisation. 1972; 47(2): 257-264. 2. Cell-mediated immunity, autoimmune diseases, genetics, and implications for clinical research Bulletin of the World Health Organisation. 1972; 47(2): 265-274. [Banks v. HHS (Case 02-0738V, 2007 U.S. Claims LEXIS 254, July 20, 2007)]. And what does not cause autism? Collins controls the US $30.5 billion annual medical research budget and is a leading medical doctor and geneticist who led the Human Genome Project. Autistic conditions affect 1 in 100 US children. They affect 1 in 64 British children [1 in 40 are boys] according to a Cambridge University study. Now reported in the English national press. Read it here and pass it on. This is a major news story. CHS is republishing the following information because results of work by Dr Bradstreet with autistic children are more likely than not to be genuine. As with all new suggested treatments, it is clearly appropriate to take a prudent approach and readers should similarly take a prudent approach to what is being suggested. “Nagalese” it seems is an enzyme which can have an effect of suppressing the proper functioning of the human immune system. A recent discovery by Dr Bradstreet in his autism clinic in America is that autistic children often have an elevated Nagalase level and this in turn his may indicate a viral cause behind the symptoms of autism. Following on from this discovery in 2011, Dr Bradstreet looked to find a treatment that would reduce the Nagalase count and found GcMAF (Gc Macrophage Activating Factor). Results so far are that 85% of the children who received GcMAF responding positively. However, there have been some reports of minimal side effects of flu-like symptons for a few hours. This is likely to be as a result of the immune system getting to work on undiagnosed viruses, as these are likely to have been the cause of the elevated Nagalase levels.